If you're striving to get a concise writing, you will be obsessed with these analysis. Phraseology makes it easier for you to jump back to a particular sentence in your document. Simply tap on a root word, scroll through the list of sentences, find one that you want to edit, and tap the Select button. When you want to arrange paragraphs and sentences, you can switch to Phraseology's Arrange view. It lets you reorder them easily - much faster than you would cut and paste them. You can also delete the ones that you no longer need. By showing how many words each sentence has, it also helps to pinpoint which sentence you need to improve. Both of these features really make Phraseology stand out from other writing apps on the App Store. Phraseology 2.0's new live linguistic syntax highlighting helps you to improve your writing as you write. With today's release, Phraseology has been updated for iOS 7. You can now use iCloud as a backup for your documents, and Dropbox as a proprietary version control. Note that Dropbox is not used as a file system, meaning you cannot see the files as .md or .txt on your Dropbox folder. Phraseology uses /Apps/Phraseology as its versioning control folder, meaning you cannot load a document from another Dropbox folder. All documents will be managed as though they are local documents - with transparent backup in iCloud and versioning control in Dropbox. You can still export your work via email, AirPrint, or other apps such as Drafts, Editorial, Byword, iA Writer, 1Writer, etc. You can also send it straight to any folder in Dropbox via the official Dropbox app. But, Phraseology is not a Dropbox-syncing text editor. You cannot sync any changes you made with other apps. Now, why would you want to write in Phraseology then? There must be a really compelling reason for you to do so. Other than its Inspect and Arrange views, Phraseology also has a great support for MultiMarkdown footnotes and tables, TextExpander snippets, and x-callback-url. And, the new version adds live syntax highlighting feature. Instead of highlighting Markdown syntax, Phraseology uses the built-in linguistic analysis algorithms on iOS to show the different parts of speech in the English language. The supported parts of speech include nouns, verbs, adjectives, adverbs, pronouns, determiners, prepositions, and conjunctions. You can activate some or all of them. Phraseology will highlight words that match the activated parts of speech. You can use this on a finished document as an evaluation, or you can also turn this feature on as you write the document. Phraseology will parse the document and show the proper syntax highlighting as you write. Phraseology's Arrange view makes refactoring easier than cut-and-paste. Because Phraseology is not a Dropbox-syncing text editor, it does not have a dialog to load a Dropbox file. It encourages you to start your writing in Phraseology, and export to the other apps when you're done. Fortunately, Phraseology has URL Schemes of its own. It currently supports both phraseology:// and x-phraseology-services://. Based on my experiments, they are identical. Using its /create URL, we can tell Phraseology to create a new document with a specified title and text. We can trigger this from any apps that allow us to create our own custom URL actions and store it for future use. If you have Drafts, you can install the Phraseology URL action from the official Drafts Action Directory. This will copy the entire [[draft]] as a new document in Phraseology. You can also load a Dropbox file from Launch Center Pro. The new Launch Center Pro for iPad app makes this feel even more natural. 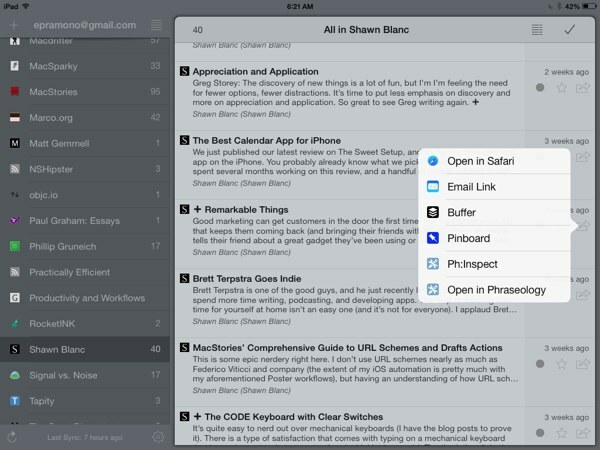 Open this link to automatically install this action on Launch Center Pro for iPad. Open this link to automatically install this action on 1Writer for iPad. Note: This action will send the currently selected text or the entire document (if you're not selecting any text) to Phraseology. If you use Editorial instead, you can install this Editorial workflow. It will create a new document in Phraseology based on the currently selected text. If no text is selected, it will use the entire document text instead. If you watch the embedded video, you will see how well Greg has baked the Ph:Inspect and Ph:Arrange features into Drafts for iPad. You can now select any number of words, sentences, or paragraphs in Drafts, and choose Ph:Inspect or Ph:Arrange from the popclip menu. It will redirect you to Phraseology to inspect and arrange that selected text and return you to Drafts with the newly arranged text replacing it. But, Greg did not stop there. He also created three Editorial workflows that allow you to perform similar actions in Editorial. And, he also opens up /inspect and /arrange as services for other apps via its URL schemes. Now, you can use them in any apps that allows you to create custom URL actions. Open this link to automatically install this action on 1Writer for iPad. Too bad there is not a good way to replace the currently selected text in 1Writer, nor to access the [path] and [type] of the active document in 1Writer. Otherwise, we could implement Ph:Arrange in 1Writer as well. As a temporary workaround, I store the newly arranged text in the clipboard instead. Ph:Inspect is now available to other apps - even Mr. Reader. Because Phraseology opens up its Ph:Inspect for other apps to integrate with, you can now use it as a way to learn from your favourite writers. For example, I love how Shawn Blanc and John Gruber write their long-form articles. To me, they write beautifully and concisely. Now, I can use Instapaper's Share to Drafts feature to copy the entire article, and have it inspected in Phraseology. Or even better, I can create a custom URL action in Mr. Reader to inspect the current article in Phraseology. Phraseology 2.0 is an awesome update to a great app. Its syntax highlighting and Ph:Inspect integration with other apps make it an essential tool for writers who want to continually improve their skills. I look forward to other developers integrating their apps with Phraseology's excellent Inspect and Arrange feature.